Our dietary supplement is formulated from an extract of saffron obtained from the crocus flower known scientifically as Crocus sativus. Though saffron is familiar as a culinary spice, used in dishes across the world for thousands of years, its therapeutic properties are less well-known. Yet traditional Ayurvedic and Persian systems of medicine have long featured Crocus sativus for its exceptional composition and health-beneficial properties, attributes which have been confirmed in numerous studies on the plant. In recent years, scientists have succeeded in isolating extracts with a high content of active substances. Such research has also led to the formulation of our new supplement based on a saffron extract. Alongside its flavour-giving properties, saffron has an unusually complex composition, with more than 100 compounds discovered so far, including active principles such as carotenoids. Known for their antioxidant potency, these compounds are natural orange, yellow and red pigments and are indeed responsible for saffron’s orange-red colour. Apart from these antioxidants, saffron is also comprised of safranal. Primarily responsible for the spice’s distinctive smell, this molecule is also used as an active principle in a number of therapeutic preparations. increase blood flow to the retina and choroid. With its high antioxidant activity, saffron extract may also offer protection against Age-related Macular Degeneration or AMD, one of the most common eye diseases. This silent, painless disease is characterised by gradual deterioration of the central part of the retina which ceases to function correctly. It is a major cause of loss of vision, primarily among the over-60s, potentially leading to complete blindness. AMD sufferers find it increasingly difficult to carry out daily functions such as reading or driving. This is why new preventive ways of combatting retinal deterioration have been developed. One such product is our dietary supplement Affron Eye® which fights the oxidative stress and free radical damage responsible for cellular ageing. Our new dietary supplement is formulated from a high quality saffron extract standardised to 3% crocin. 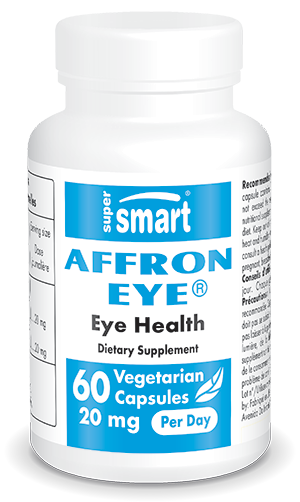 Affron Eye® is available in capsule form, with a suggested dose of two capsules a day. It can, if necessary, be taken alongside our formulation Macula Plus. Other ingredients: maltodextrin, magnesium stearate, silicon dioxide. Affron Eye®, Pharmactive, Spain.